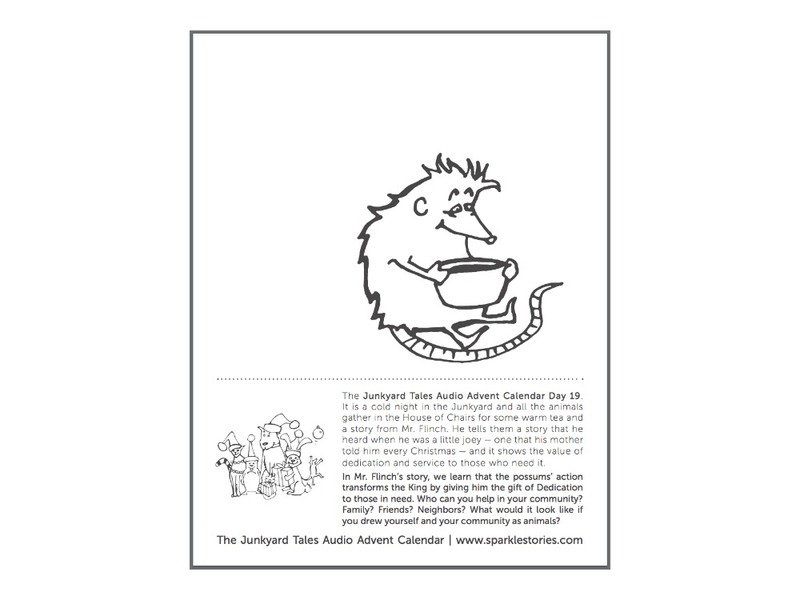 The Junkyard Tales Audio Advent Calendar Day 19. It is a cold night in the Junkyard and all the animals gather in the House of Chairs for some warm tea and a story from Mr. Flinch. He tells them a story that he heard when he was a little joey — one that his mother told him every Christmas — and it shows the value of dedication and service to those who need it. In Mr. Flinch’s story, we learn that the possums’ action transforms the King by giving him the gift of Dedication to those in need. Who can you help in your community? Family? Friends? Neighbors? What would it look like if you drew yourself and your community as animals?